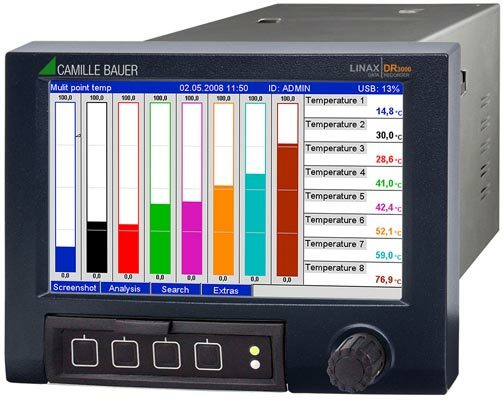 The LINAX DR3000 videographic recorder is a high-performance recorder with a 7-inch TFT display. Up to 20 analogue universal inputs or up to 40 channels are available for data via MODBUS. Digital inputs as well as frequency inputs may be processed. Limit values or other switching statuses are issued via relays, digital outputs or bus systems. Apart from RS232, RS485 (MODBUS) and Ethernet with integrated webserver, communication is possible via Profibus DP. Recording of batches, processing of data by mathematic functions, addressing of modems or sending of an SMS in case of an alarm are some of the functions which may be added as required. Data is primarily recorded on an internal non-volatile ring buffer and stored on an external SD memory card in periodic cycles. In addition, data may easily be stored on a USB stick. Via further USB interfaces, other peripheral devices like printers or external keyboards may be connected without any problem. A powerful PC software processes and analyses the data and is also capable of comparing and visualising the data of several recorders. The recorder corresponds to the guidelines in accordance with FDA 21 CFR Part 11 thus being equivalent to paper recorders in respect of data safety and legal validity (e.g. in relation to authorities).